An Assistant Soccer Coach is a seasoned player who knows the nuances of the game and supports the Soccer coach in motivating the team to play. 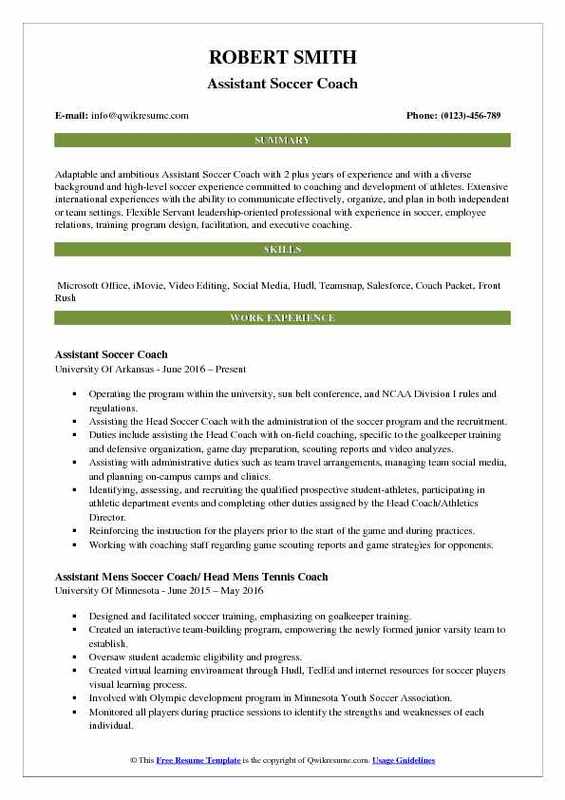 This challenging job puts various tasks into the Assistant Soccer Coach Resume like inventing strategies to improve game performance, assisting the soccer coach in creating opportunities for players to learn and develop gaming skills and sportsmanship. They also help the players to practice on the line of attacks and keep the coach informed of player’s development, inspect and verify the playing condition and take routine follow-up drills for the soccer players. An Assistant Soccer Coach should have a thorough knowledge of the game and stay abreast of the latest strategies and counter tactics. 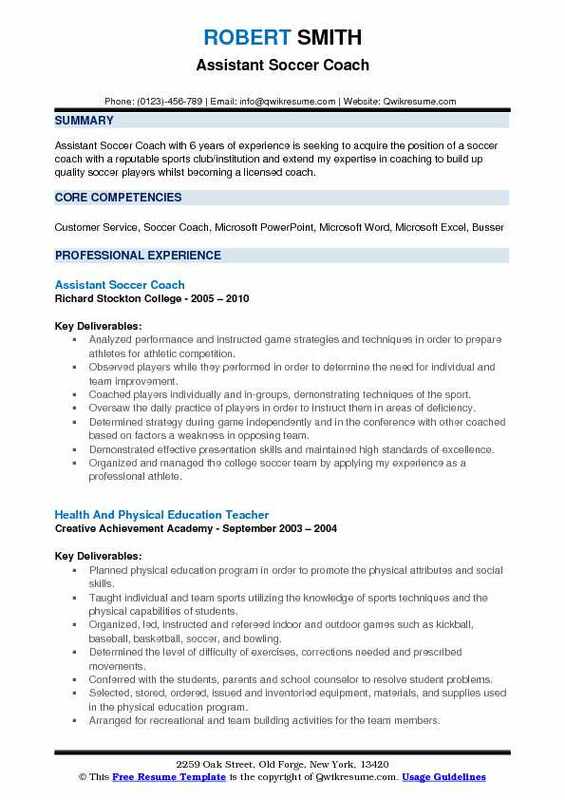 To hone the position of an Assistant Soccer coach, candidates should have been a profound soccer player with all-around knowledge of the game and have a High School diploma. 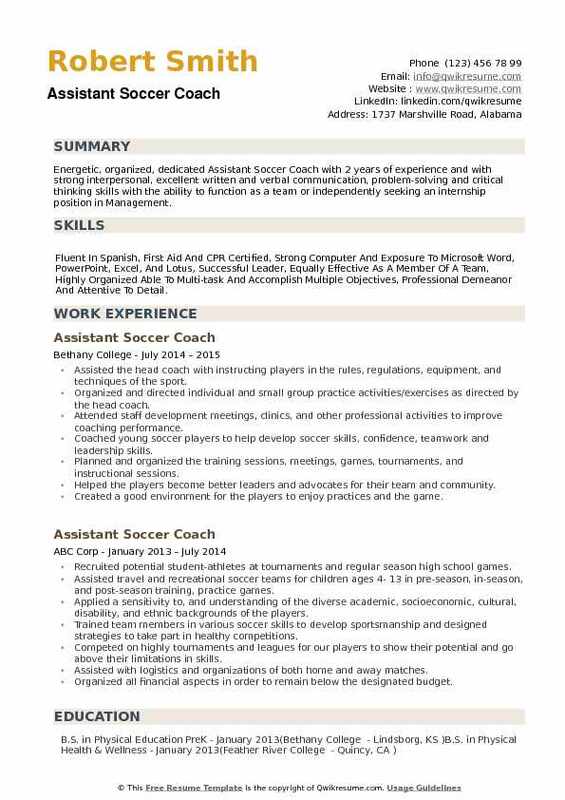 Objective : Assistant Soccer Coach with 4 years of experience. Understanding and patient with all kinds of projects, enthusiastic, detail-oriented, calm under pressure, strong organizational and team building skills. Planned trips, arranged food, hotels, and methods of transportation (charter buses and air flight) for the team during games. Administrator of the team's social media, which includes Facebook, Twitter, Instagram, Youtube and Vimeo accounts. Created and uploaded the promotional videos for the team's social media to attract student-athletes to the program and the school. Recruited more than 500 student-athletes from all areas of the united states to visit Nova Southeastern University and participated at soccer camps. Worked along with the admissions department in order to guide student-athletes with college applications and scholarships. Wrote creative copy for catalogs, brochures, and other direct mail projects. Edited film games, interviewed players, wrote stories and uploaded them on the team's social media. In charge of contact with other coaches in our conference for the scheduling of games/scrimmages. Organized nine id camps and two residential soccer camp. In charge of hiring coaches, organize food, equipment, and budgets during camps. 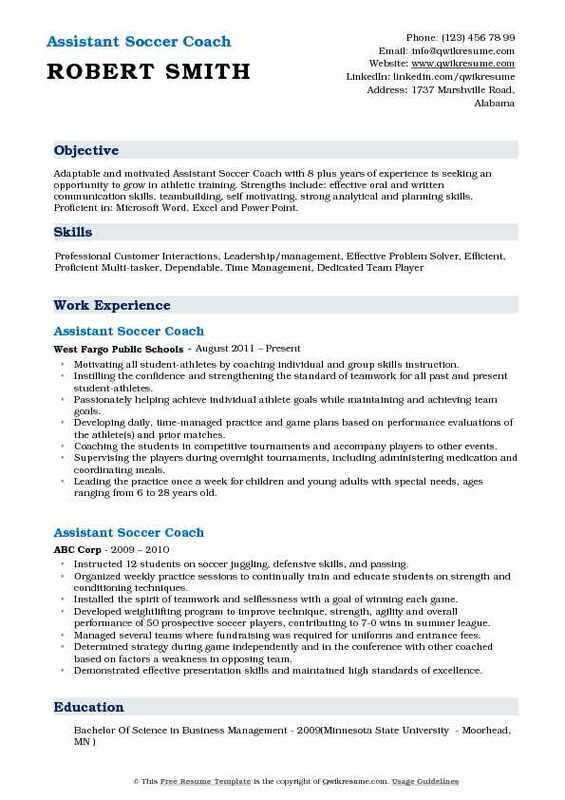 Headline : Assistant Soccer Coach with 6 years of experience is seeking to acquire the position of a soccer coach with a reputable sports club/institution and extend my expertise in coaching to build up quality soccer players whilst becoming a licensed coach. Analyzed performance and instructed game strategies and techniques in order to prepare athletes for athletic competition. Observed players while they performed in order to determine the need for individual and team improvement. Coached players individually and in-groups, demonstrating techniques of the sport. Oversaw the daily practice of players in order to instruct them in areas of deficiency. Determined strategy during game independently and in the conference with other coached based on factors a weakness in opposing team. Demonstrated effective presentation skills and maintained high standards of excellence. Organized and managed the college soccer team by applying my experience as a professional athlete. Trained and managed several men, teams and soccer camps that achieved significant improvements in their productivity. Conference champs 3 out of the 5 years coaching at Richard Stockton College. 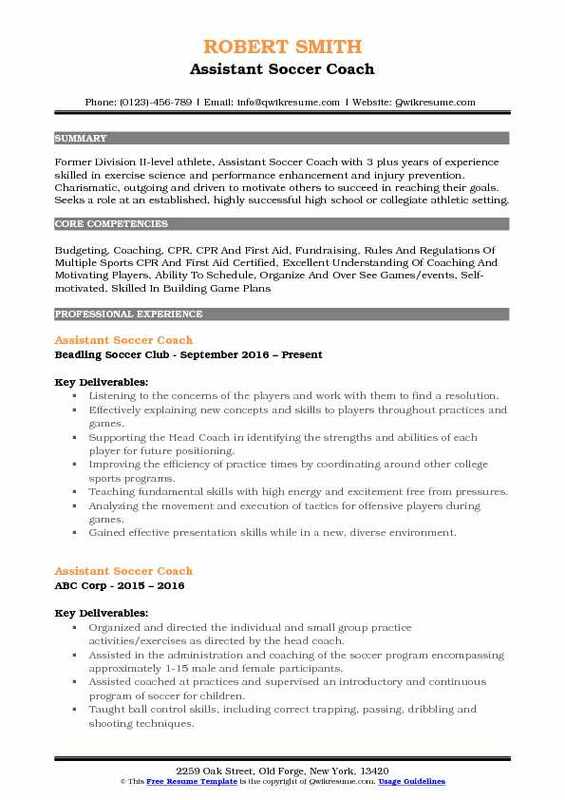 Objective : Adaptable and ambitious Assistant Soccer Coach with 2 plus years of experience and with a diverse background and high-level soccer experience committed to coaching and development of athletes. Extensive international experiences with the ability to communicate effectively, organize, and plan in both independent or team settings. Flexible Servant leadership-oriented professional with experience in soccer, employee relations, training program design, facilitation, and executive coaching. Operating the program within the university, sun belt conference, and NCAA Division I rules and regulations. 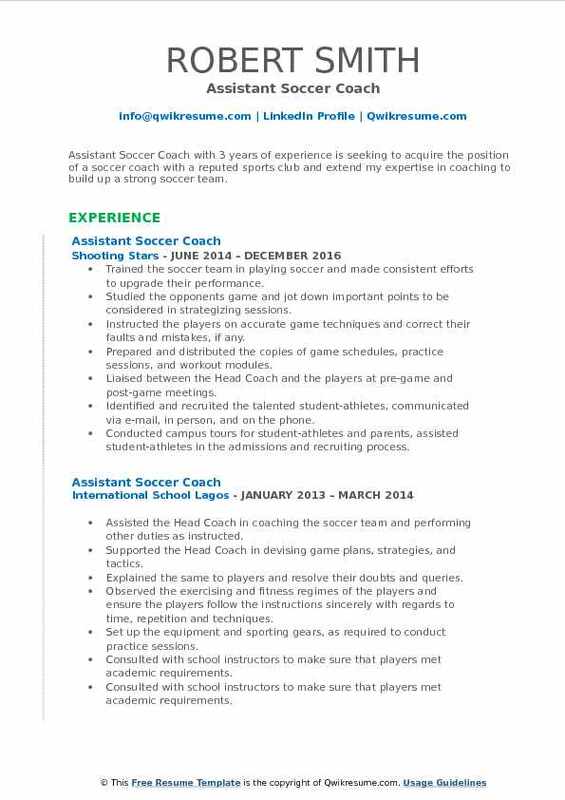 Assisting the Head Soccer Coach with the administration of the soccer program and the recruitment. Duties include assisting the Head Coach with on-field coaching, specific to the goalkeeper training and defensive organization, game day preparation, scouting reports and video analyzes. Assisting with administrative duties such as team travel arrangements, managing team social media, and planning on-campus camps and clinics. Identifying, assessing, and recruiting the qualified prospective student-athletes, participating in athletic department events and completing other duties assigned by the Head Coach/Athletics Director. Reinforcing the instruction for the players prior to the start of the game and during practices. Working with coaching staff regarding game scouting reports and game strategies for opponents. 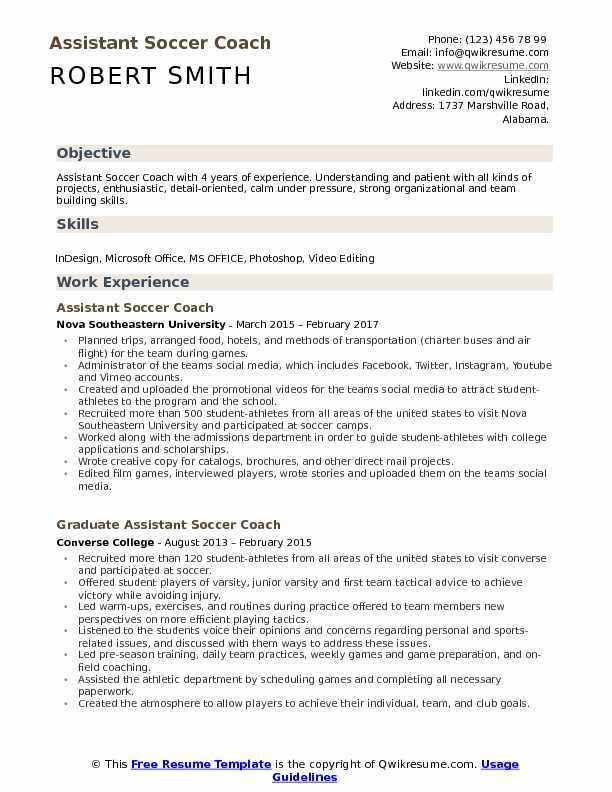 Objective : Assistant Soccer Coach with 3 years of experience is seeking to acquire the position of a soccer coach with a reputed sports club and extend my expertise in coaching to build up a strong soccer team. Trained the soccer team in playing soccer and made consistent efforts to upgrade their performance. Studied the opponent's game and jot down important points to be considered in strategizing sessions. Instructed the players on accurate game techniques and correct their faults and mistakes, if any. Prepared and distributed the copies of game schedules, practice sessions, and workout modules. Liaised between the Head Coach and the players at pre-game and post-game meetings. Identified and recruited the talented student-athletes, communicated via e-mail, in person, and on the phone. Conducted campus tours for student-athletes and parents, assisted student-athletes in the admissions and recruiting process. Developed and organized online recruiting database and oversaw recruiting. Communicated with prospective student-athletes, parents, and club coaches. 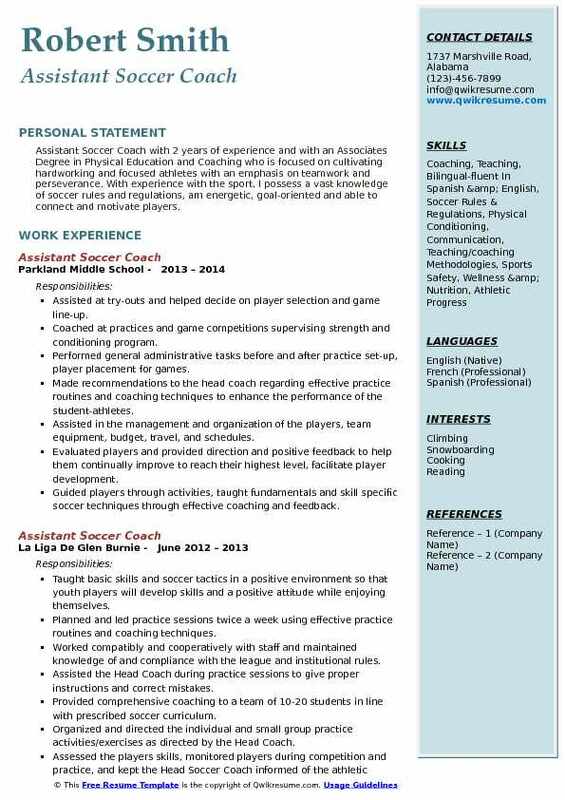 Objective : Assistant Soccer Coach with 2 years of experience and with an Associates Degree in Physical Education and Coaching who is focused on cultivating hardworking and focused athletes with an emphasis on teamwork and perseverance. With experience with the sport, I possess a vast knowledge of soccer rules and regulations, am energetic, goal-oriented and able to connect and motivate players. Assisted at try-outs and helped decide on player selection and game line-up. Coached at practices and game competitions supervising strength and conditioning program. Performed general administrative tasks: before and after practice set-up, player placement for games. Made recommendations to the head coach regarding effective practice routines and coaching techniques to enhance the performance of the student-athletes. Assisted in the management and organization of the players, team equipment, budget, travel, and schedules. Evaluated players and provided direction and positive feedback to help them continually improve to reach their highest level, facilitate player development. Guided players through activities, taught fundamentals and skill specific soccer techniques through effective coaching and feedback. Worked and helped the Head Coach to set up equipment, developed strategies, and drills and implemented same during the practice session. Summary : Adaptable and motivated Assistant Soccer Coach with 8 plus years of experience is seeking an opportunity to grow in athletic training. Strengths include: effective oral and written communication skills, teambuilding, self motivating, strong analytical and planning skills. Proficient in: Microsoft Word, Excel and Power Point. Motivating all student-athletes by coaching individual and group skills instruction. Instilling the confidence and strengthening the standard of teamwork for all past and present student-athletes. Passionately helping achieve individual athlete goals while maintaining and achieving team goals. Developing daily, time-managed practice and game plans based on performance evaluations of the athlete(s) and prior matches. Coaching the students in competitive tournaments and accompany players to other events. Supervising the players during overnight tournaments, including administering medication and coordinating meals. Leading the practice once a week for children and young adults with special needs, ages ranging from 6 to 28 years old. Coaching the players on tricks to overthrow the opponent including dribbling, trapping, shooting, and customized plays. Summary : Assistant Soccer Coach I with 12 years of experience is seeking to acquire a position as a personal trainer so that I can show others how to achieve a fit and healthy lifestyle. Coached 40 varsity and junior varsity boys’ soccer players in summer league and camps. Designed the training sessions for the goalkeepers so they can be more technically sound and extend their range. Assisted the Head Coach during practices and games for both the boys and girls soccer seasons. Coordinated games, transportation, food, and equipment for the teams. Worked with players, their parents, and community members in fundraisers for both teams. Organized and directed individual and small group practice activities exercises as directed by the head coach. Objective : Former Division II-level athlete, Assistant Soccer Coach with 3 plus years of experience skilled in exercise science and performance enhancement and injury prevention. Charismatic, outgoing and driven to motivate others to succeed in reaching their goals. Seeks a role at an established, highly successful high school or collegiate athletic setting. Listening to the concerns of the players and work with them to find a resolution. Effectively explaining new concepts and skills to players throughout practices and games. Supporting the Head Coach in identifying the strengths and abilities of each player for future positioning. Improving the efficiency of practice times by coordinating around other college sports programs. Teaching fundamental skills with high energy and excitement free from pressures. Analyzing the movement and execution of tactics for offensive players during games. Gained effective presentation skills while in a new, diverse environment. Managed a 12-week time schedule that was both physically and mentally demanding. Training the offensive players based on our coaching staffs objectives for the week. Facilitating preseason, season, and post-season training sessions game preparation. 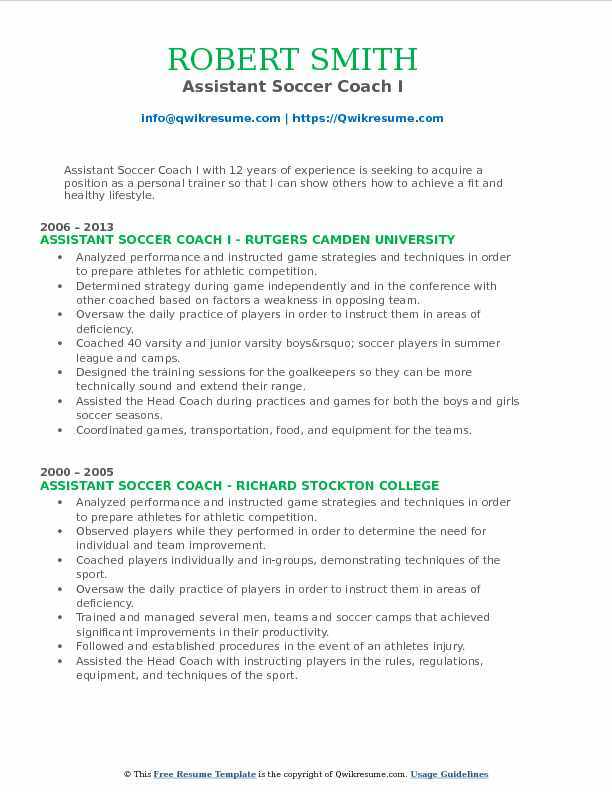 Objective : Assistant Soccer Coach with 4 plus years of experience is seeking to work in a dynamic workplace and be part of a team that shares the same passion for health and wellness as I do. My goal is to formulate cutting-edge training programs, provide coaching and support, and teach others valuable sporting skills while also developing my own knowledge of coaching and sport. Assessing players skills, monitoring players during competition and practice. Keeping the Head Soccer Coach informed of the athletic performance of students. Monitoring all players during practice sessions to identify the strengths and weaknesses of each individual. Developing a program to observe players during drills and games and identifying all special requirements to implement customized modules as required. Assisting the Head Coach in training, recruiting, scheduling, fiscal planning, player and student development, and game day operations. Teaching and promoting the appropriate teamwork, sportsmanship, nutrition and healthy lifestyle choices. Assisting the Head Coach in the preparation and execution of practice and game situations. Responsible for assuring that the players understood the fundamentals of soccer showing good sportsmanship as well as overseeing the safety of the children while in my care. 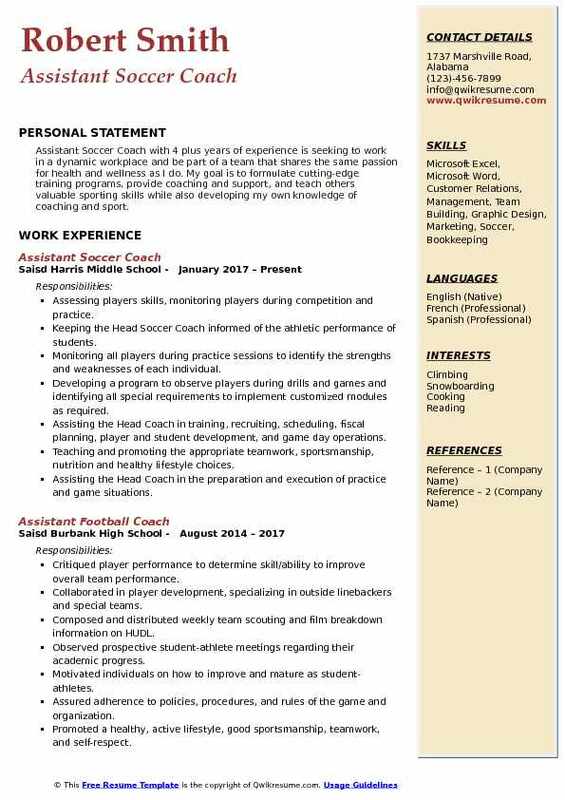 Objective : Energetic, organized, dedicated Assistant Soccer Coach with 2 years of experience and with strong interpersonal, excellent written and verbal communication, problem-solving and critical thinking skills with the ability to function as a team or independently seeking an internship position in Management. Skills : Fluent In Spanish, First Aid And CPR Certified, Strong Computer And Exposure To Microsoft Word, PowerPoint, Excel, And Lotus, Successful Leader, Equally Effective As A Member Of A Team, Highly Organized Able To Multi-task And Accomplish Multiple Objectives, Professional Demeanor And Attentive To Detail. Assisted the head coach with instructing players in the rules, regulations, equipment, and techniques of the sport. Organized and directed individual and small group practice activities/exercises as directed by the head coach. Attended staff development meetings, clinics, and other professional activities to improve coaching performance. Coached young soccer players to help develop soccer skills, confidence, teamwork and leadership skills. Planned and organized the training sessions, meetings, games, tournaments, and instructional sessions. Helped the players become better leaders and advocates for their team and community. Created a good environment for the players to enjoy practices and the game. Built relationships with players and parents to find whats best for the student on and off the field. Worked in the office of the athletic director to compile and publish stats during the off­season. Developed custom training programs for goalkeepers to enhance skills used in games.